Ready cut hexagon, diamond, and square patchwork paper templates. Also other shapes. Miniature from 5cm each side. Jackie Wills has sold these products online from UK since 2003 . Accurate shapes, beautifully presented and great customer service. 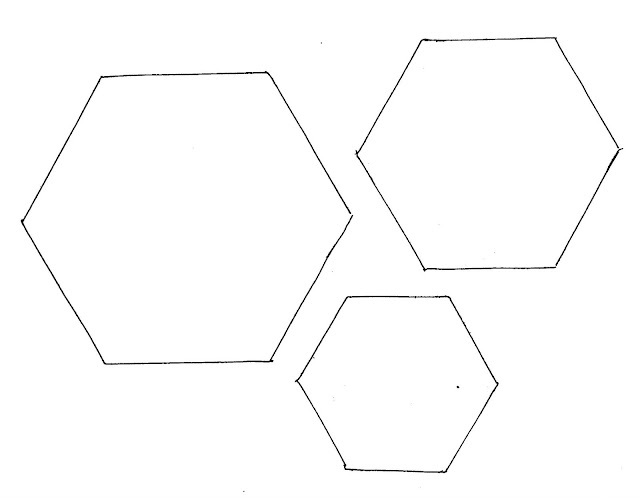 How about trying 3cm hexagon paper templates, each side measures 1.5cm so about the size of a 2p coin plus the six corners. Ideal for using those small pieces of treasured fabric that you cannot bear to throw away. Save yourself the laborious chore of cutting your own paper templates. Above right: The image shows newspaper paper templates circa 1835. The quilt belongs to one of my customers who kindly let me photograph the work. It is a testimony that with care hexagon patchwork can survive as a wonderful family heirloom. Interestingly the tacking was sewn through both the paper and fabric, the same method that I use today. I created the piece above in the 1960's, when I was about 12 years old. The cotton fabrics are so obviously vintage. Note the reason NOT to sew your hexagons together with white thread. The hexagons measure 6/10ths inch each side. 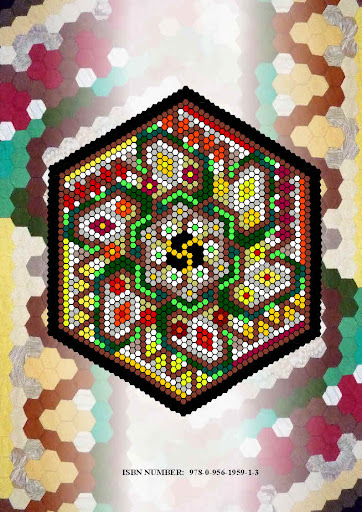 The video clip above to demonstrate how to create hexagon patchwork. The basic method has not changed. See samples on this page. "Parcel of hexagons etc arrived this morning. It's all FAB! Thank you very much, and for sending it so quickly. I'm so excited about getting started with the patchworks - it's a new venture! Which makes the instruction leaflet and the sample especially welcome and thoughtful. Also looking forward to having a look at the demos on YouTube. Once again - many thanks, and I shall return for more"
"Thank you so much for the prompt delivery of my order and the lovely way it was wrapped. I will certainly recommend you to my sewing friends. Important note: technology does not guarantee the accuracy or size of hexagons after printing from this page or purchase hexagons from this website. Re-cycling garment above. Cut seams, remove selvedge edges, work to the grain of the fabric - tear into strips, using hexagon as a guide, cut rectangles. Allow about 1cm seam allowance all around. 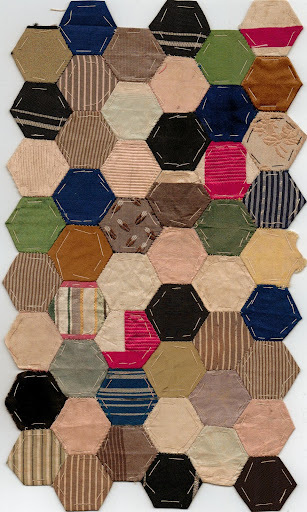 Tack paper hexagon to paper as shown above then sew hexagons together. My aim is to dispatch items within 72 hours of receiving payment, excluding weekends. If I am away from studio for more than 72 hours a notice will appear on this page. Templates currently available shown in table below. Happy to create custom orders for shapes/quantities not listed. Templates cut using 90 gsm paper. 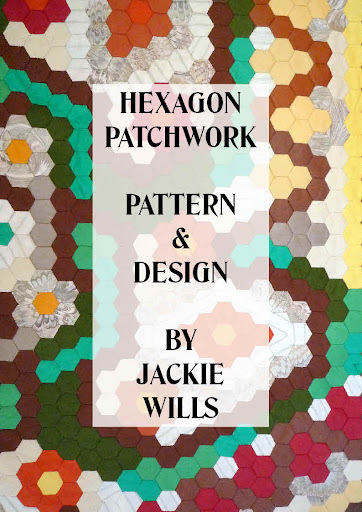 Devon born Jackie has been addicted to sewing hexagons for more than 45 years. She won her first commission 1984 and since then has sold more than 900 works. Specialising in hand painted, machine embroidered denim and hand sewn chintz patchwork. She started selling ready cut paper templates online 2003 after hearing the comment "Oh, I would love to do what you do but cannot be bothered to cut up all those fiddly papers" heard time and time again. This is a fast track start to your own heirloom quilt. Easily transport your tin of prepared fabric, templates, needles, tacking cotton, quality thread and snippers. Sew anywhere, traveling, commuting, on holiday, in front of the TV, whilst chatting to friends, whilst convalescing. Above detail of "The Happiness Quilt" (1988) by Jackie Wills. 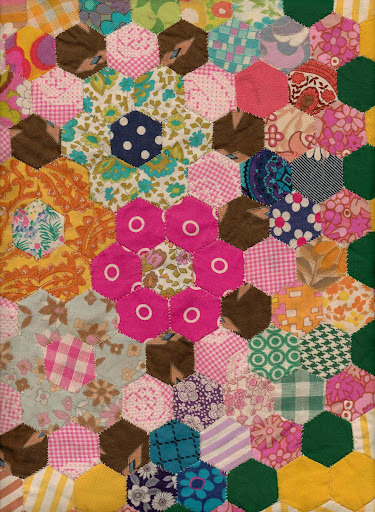 Total 3423 hand sewn chintz hexagons.